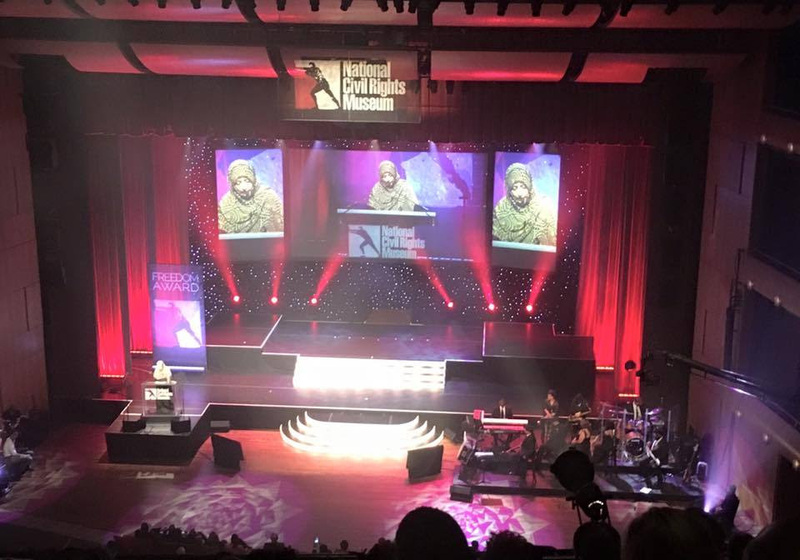 Yemen’s Nobel Peace Prize Laureate and human rights activist Tawakkol Karman was granted today the 2016 Freedom Award by the US National Civil Rights Museum. Having received the prize, Tawakkol Karman became the first Yemeni woman to win the Freedom Award granted to outstanding individuals who have contributed gratefully to civil and human rights and laid the groundwork for present and future leaders in the battle for human rights. 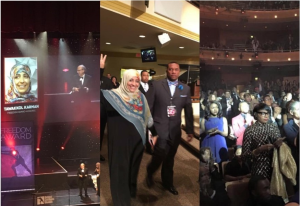 Karman said she is very proud of being honored with the Freedom Award, calling on the world’s people to unite against tyranny, injustice and human rights violations and work wholeheartedly for human values. The museum, whose exhibits trace the history of the Civil Rights Yemen Movement in the United States from the 17th century to the present, is located around the former Lorraine Motel, where Martin Luther King was assassinated on April 4, 1968. The National Civil Rights Museum has honored many prominent figures around the world, including former South African President Nelson Mandela, former President Carter, former President Bill Clinton, former Soviet statesman Gorbachev, founder of Doctors Without Borders Kouchner, the spiritual and temporal ruler of Tibet Dalai Lama and the founder of Grameen Bank Muhammad Yunus. Tawakkol Karman‘s speech at the freedom prize ceremony. It is great honor for me to be with you today.. I’m confident that we share the same belief regarding the basic human values in this earth, on top of which are the two great freedom and dignity values.. I’m proud of this honor, which inspires me more determination to move forward in our great struggle for freedom and dignity along with many youth we have the same dream and determination in common with. I accept this award on my behalf and on behalf of the Yemeni and Arab youth, who have a dream of freedom and dignity.. of those who are fed up with autocracy and government of tyranny, corruption and failure..of those who aspire for the state of justice, equality and law..
On 4th April 1968, a treacherous bullet settled at Martin Luther King’s neck, killing one of the most exceptional and inspiring personalities of human history.. Martin Luther was preparing to address the audience about the significance of what they were doing to combat fanaticism and racism.. Martin Luther King died but his words continued to inspire millions of people, not only in the US, but also around the world, on the significance of peaceful straggle to denounce racism and hatred..
Fifty years since his painful departure, King’s live spirit is still roaming the world, urging us to adhere to every dream and struggle wherever racism and fanaticism exist.. His spirit is calling upon us to continue the march and isolate racism in this world.. racism shall be incriminated by law everywhere.. When we read about the reasons that let Martin Luther King to choose the road of freedom and combating racism, we will understand that things might not change the way we want.. wherever racism and racists still humiliate life, humanity is killed every moment at different parts of the world.. it is true things have become better than they were before seventy years, yet racists and tyrannies are still in the world.. for me no boundaries between a racist and a dictator. In the end, racism and despotism need each other, which requires us to pay particular attention to while fighting against both..
Six years ago, in 2011, we had a hope for change.. The Arab Spring’s female and male youth presented a bright image of peaceful struggle in combating police state that resorted to crime practices and claimed to be patriotic.. streets and squares were full of people of all ages.. the scene of mass protests demanding freedom and chanting against despotism, oppression and racism was so magnificent and amazing.. Many concerned people around the world expressed their admiration for our great peaceful struggle for the cause of freedom.. me and my colleagues in this historical event understand the responsibility laid on our shoulders to get rid of these fascist totalitarian regimes in our countries.. In my country Yemen, the greatest peaceful revolution was betrayed, the armed Houthi militia allied with ousted president Ali Saleh and with the support and backing of Iran took over many cities, undermining the transitional process that resulted from the revolution and causing limitless wars and catastrophes.. today, after two years of the coup d’ etat and fighting, I’m confident that our people will overcome both; coup and war.. and will bring them down and go on to achieve our noble dream that the revolution called for;State of freedom, equal citizenship, democracy and role of law.. In Syria, despite mounting heinous crimes of Bashar Al-Assad, people there will see the light and freedom at the end of the tunnel.. such extremist regime shall not escape penalty.. it will be penalized certainly.. in Egypt, the military coup d’ etat will not be able to suppress civil state and democracy no matter what he does.. all experiences tell us that military cannot confront peaceful struggle movement no matter how cruel they are..
“Injustice anywhere is a threat to justice everywhere”, this is what Dr. Martin Luther King said, therefore we all need to unite against despotism, injustice and human rights violations.. we’ve to work for our human values with sincerity, this will make us more secure and more safe..
Peace within the nations is no less urgent today than peace between the nations. And the people in my country and in the region from which I came are terrorized today by bloody dictators and by the international powers that back them, and they are abused by terrorist groups that misuse and abuse our faith. Every dictator is our region is a terrorist, and every terrorist is a dictator. And there will no path to the holy peace we aspire for, until dictators are swept away from our region, and terrorists are deprived from abusing our religion. Despotism is no longer an internal affair to this or that state.. despotism’s consequences have spilled over into democratic states, through terror, yes terror is the legitimate son of despotism.. tyrannies produce nothing but terror, death and starvation.. we’ve to realize the need to be together as when we are divided, evil ideologies will win..
I’ve a dream like the one King had, and I believe you too have a dream.. so let us work with all love and devotion for it.. this world shall be free from masters and slaves, a world that respects human being without discrimination.. I dedicate this award to the Yemeni and Arab youth who have desire and courage for freedom anddignity. I also donate the $50,000 prize money to relief work in Yemen, particularly in Tihama. Despite the fact that this contribution is very modest, it is of great symbolic significance as it urges all concerned countries, organizations and individuals to make the utmost efforts to provide relief work in Yemen where people are now in desperate need of help because of the coup, which has caused crises and disasters to the country.